Home to your favourite brands, colour expertise, and trade signs knowledge. Tolly Signs has been providing quality signs and designs for well over 46 years. We are more than just employers and employees, we are a family. Each one of us has our own specialty and together we make a great team. Because our name is attached to everything that we make, you can be sure that your project will be done right. We take pride in the quality of work that we do. 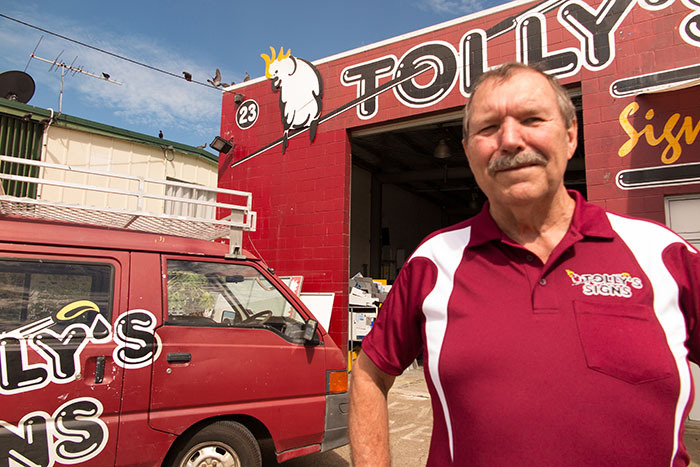 Mr Tolly love for sign writing the traditional way (which was by hand) began at the age of 16. He started his own business in 1969, since then he has serviced the sign industry in Far North Queensland and has trained numerous amount of apprentices and has supported businesses, charity and sporting organisations in the Far North Queensland. Our talented graphics artists will create the perfect image for your signage needs. They offer several options in the design process, giving you a sign you can appreciate and be proud of for the years to come. After all, your logo is your business, and our business to ensure you look spectacular. Often customers bring in their own logo, and we add the designer touches that set you apart from your competitor. The basic construction of all signage is done in the fabrication department. We have a 850 square metres manufacturing facility, where skilled wood and metal craftsmen fabricate each sign to exact blueprint specifications. We work with everything from internally illuminated plastic sign cabinets and letters, to intricate sheet metal aluminum sign structures, for long term durability. Fabricators are the backbone of any sign shop, and we have the experience to get the job done in a timely manner. Our aim is to offer our customers the perfect solution to their signage needs. We will only use the highest quality material when manufacturing or fabricating our signs. So that they not only look good but stay looking good for longer. We feel very proud and honoured to supporting the local sports clubs.